Pre-Thanksgiving surveys indicated that more people intended to shop online this year than in the past. That sentiment did translate into actual behavior, as Black Friday in-store traffic was down according to retail analytics firms. Store traffic down somewhat vs. 2017. RetailNext reported that on Thanksgiving and Black Friday sales in stores were down 4 to 7 percent and foot traffic was down 5 to 9 percent. Rival ShopperTrak said visits on Thanksgiving Day and Black Friday were down 1 percent for the two-day shopping period and down 1.7 percent on Black Friday compared with last year. The National Retail Federation (NRF) reported that over the past weekend 165 million people shopped either online or in stores or both. That compares with 174 million a year ago. NRF estimated that there were 67 million people in stores on Black Friday versus 77 million in 2017. Walmart dominated visitation. 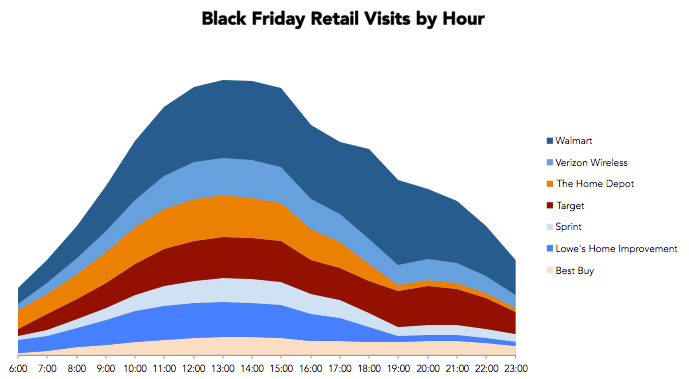 Location analytics firm Reveal Mobile measured real-time Black Friday store visits. The company said that Walmart received 3.4 percent of all U.S. retail store visits on Black Friday. That was followed by Target (1.8 percent), Verizon Wireless (1.4 percent), Home Depot (1.4 percent), Lowe’s (1.2 percent), Spring (0.8 percent) and Best Buy (0.7 percent). Combined, these account for roughly 11 percent of all retail store visits on Black Friday. The company also said that early morning Black Friday lines are becoming a thing of the past. According to Reveal, Black Friday “rush hour” occurred between 11 a.m. and 3 p.m.
What matters to marketers. There are a number of takeaways from this and other data released over the past several days. Online revenues set records, but it remains to be seen how stores performed. Overall there should be sales growth when online and offline results are combined. Historically online and offline shopping have been seen in opposition. As more direct-to-consumer brands open physical stores and as more traditional retailers concentrate on growing the online channel, we’ve entered a more complex and dynamic retail era. And, while online did capture some share from stores, more consumers are relying on multiple channels before buying. Stores are also instrumental in supporting online shopping, especially for Millennials.